(CNN) -- South Korean and American warships stopped a suspected pirate attack on an Egyptian ship in the Gulf of Aden, capturing 17 suspected pirates, the U.S. Navy announced Thursday. The USS Gettyburg helped stopped a suspected pirate attack, detaining 17 people. 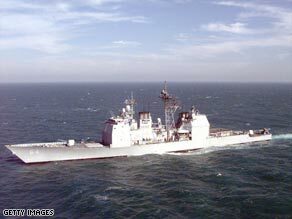 The South Korean destroyer ROKS Munmu the Great and cruiser USS Gettysburg launched helicopters in response to a distress call from the MV Amira, the Navy statement said. While en route to the Egyptian-flagged ship, they spotted a dhow that the navies suspected was being used as a pirate "mother ship." An American search-and-seizure team boarded the dhow and found eight assault rifles, a rocket-propelled grenade launcher and one rocket-propelled grenade, the Navy said. All 17 people aboard the boat were detained. It was the first time the anti-piracy task force CTF 151 had captured suspected pirates, the Navy said. Numerous military ships from around the world have been dispatched to patrol the waters off the coast of Somalia in the face of an explosion in piracy in the region over the past several years. Pirates currently hold 15 ships, said Cyrus Mody of the International Maritime Bureau, which monitors piracy worldwide. All those ships were seized in the waters off the east coast of Africa, he told CNN.